There’s no doubt that the poor mental health of the nation is a problem. But in a world where there are so many things that are crying out for attention, it’s difficult to get anyone to take notice. 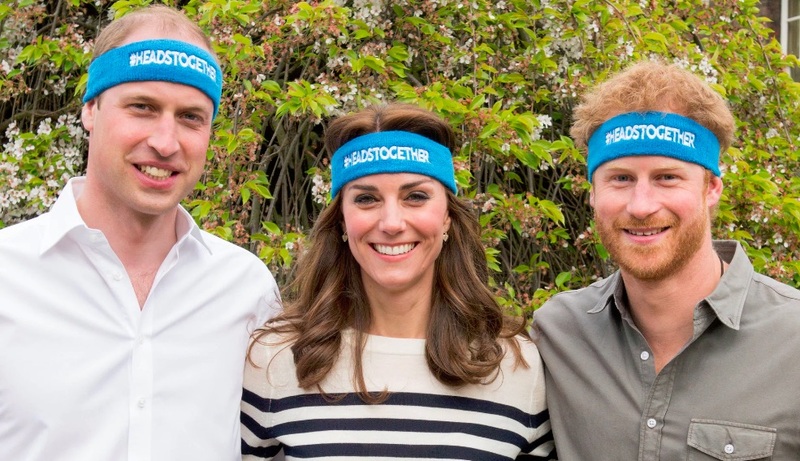 How great therefore that the fab trio of royals are using their position to highlight the problem and bring attention to how severe it’s become. What seems to be lacking now is any kind of creativity in finding a solution. Without a creative approach everyone falls back to the default position of “we just need to raise money”. Money is easy, but usually an ineffective solution to most problems. Money absolves guilt… “I gave, so I did my bit”. It’s quick… “Text this number. Click that Kickstarter. Push the Paypal button.” But what kind of problems does money solve and what greater problems does it cause? The only options money can buy are experts, consultants, therapists and medication. We’ve already got too much medication (because it’s the cheapest option), and the jury’s out, on how effective psychotherapy actually is. A lot of recent articles, have focused on the reluctance of men to talk about their problems. This is blamed on the “stiff upper lip” stoicism we expect of them. But is this the real reason? Many people won’t go to a psychotherapist because they’ve become such a cliché (Lie on a couch and talk to a stranger about my feelings? Do I look like Woody Allen?). Stories of people who’ve been in therapy for years (and at great expense) but who haven’t achieved any great transformation, are commonplace. Perhaps another reason for the reluctance to visit an “expert” is the prevalence of psychology in the mainstream — from magazines and TV psychodramas to conversations on the bus, we’re all more well informed about our psychology now. For instance, if someone says “I’m always falling in love with unavailable men” it doesn’t take an academic to say “Well dearie, growing up, you were ignored by your father, so it seems you’re repeating a pattern that’s familiar to you.” This idea (we choose a pattern of behaviour that’s familiar, rather than optimal) is so obvious, that it’s now become common sense. What’s not common sense is how to stop doing it. Sadly, this is down to us. Therapists are great at listening to the problem, describing the problem, and charging for the problem, but does that solve it? The solution (as Einstein would say) requires different thinking. Stress, anxiety and depression have their origins in two different camps. First — external stuff. Anybody experiencing grief, loss, heartbreak, betrayal or injustice is bound to feel painful emotions, which need to be acknowledged and felt. We can’t live in a world where we medicate sadness, anger, guilt or humiliation. They’re a natural response to life events. In the old days, emotional pain was processed in communities. If somebody died people would wail, cry, sing and be comforted and held by the tribe. Contrast this to the picture of the young princes, William and Harry, with their stiff upper lips, following their mother’s coffin. We call this dignity and maturity instead of using its more appropriate description — completely bonkers. Second — an internal state. This is more tricky, because it doesn’t appear to have any cause. There is nothing specifically to rage against — like disappointment, unfairness or injustice. It’s a feeling of loss, but not of a person, a job or a lifestyle. It’s a loss of something more abstract, more valuable, more infinite. We’re disconnected from life force energy, from our creativity, resulting in a lack of vitality and a deep melancholy that can’t be relieved by anything in the physical world. This second kind of depression isn’t a mental problem, it’s a spiritual crisis. We’re too smart now to believe in the kind of God we heard about in childhood — God as a large person who rewards those who are good and punishes those who aren’t. In other words, God as Father Christmas, heaven as a place, somewhere above the North Pole. We don’t know how to have a meaningful connection with a more abstract idea (God as the creative energy of the universe, heaven as a dimension) because it’s too difficult for the ego mind, which likes solid things. We could stretch our consciousness to a higher level, to meet this unreasonable God (the one beyond reason, time and space) but that would require effort. Because of this we’re susceptible to being manipulated by Marketing, which adds shape and form to the abstract things we are craving, and then sells the low res versions back to us. If we’re missing a connection to the infinite… social media is a good substitute. If we can’t access our creativity… a webinar will tell us stuff we already know. (And annoyingly remind us that creativity can’t be accessed by the mind). This is like trading an old lamp containing a magical genie for a shiny new lamp that’s empty. We need different thinking, different archetypes to act as role models, and who better to spearhead this campaign than William, Harry and Kate. After all, they’re just like their fictional Harry Potter counterparts (the serious one with all the responsibility, the red headed joker with a big heart, and the super smart, practical girl). Compare these to the current “Old Guard” archetypes of Trump (Narcissist man child) Bannon (Machiavellian manipulator) and Melania (Damsel victim in a tower). In the Harry Potter books, bad stuff was going down (as the Old Guard tried to keep control) so the three heroes formed their own club of volunteers to teach themselves Defence Against the Dark Arts. We could do with some skills in self-defence — against narcissism, manipulation and the dark glamour of victimhood. We long for an experience of the mystical — true connectivity, genius creativity and unconditional love. But meanwhile, we carry on business as normal. Talking about our problems, raising awareness and forming charities. According to the latest statistics there are approximately 400,000 charities in the UK. Each have their own staff, their own agendas and their own running costs. Everyone’s fundraising.